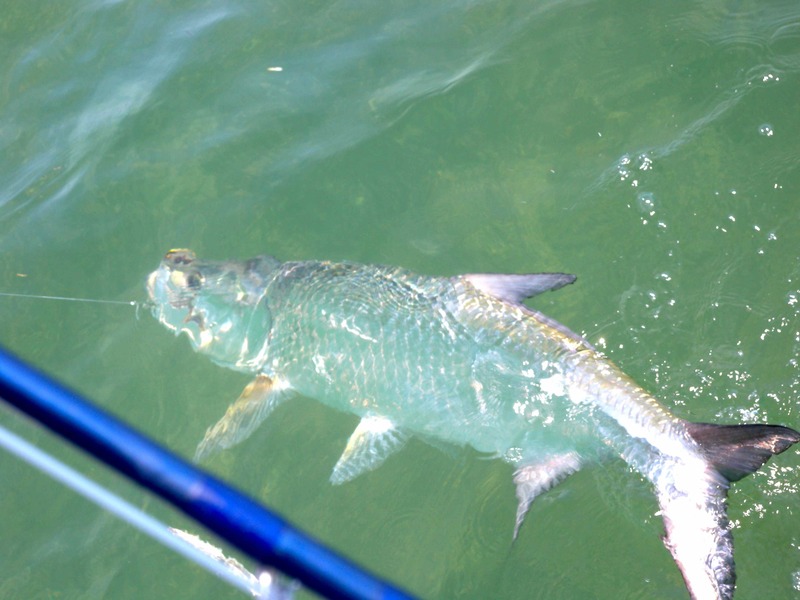 The Florida Keys is the best place in the world to catch a tarpon. The fish here average close to 100lb, and many are much larger than this. 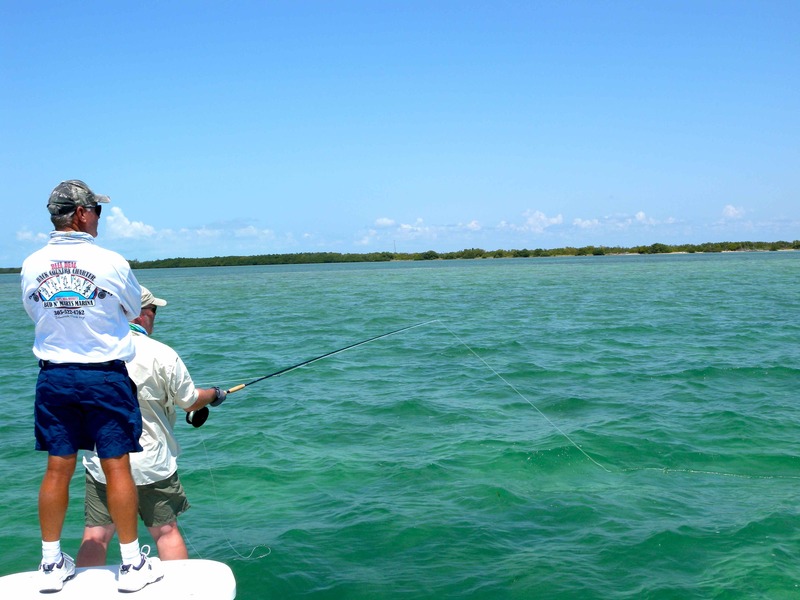 Catching them usually involves fishing either a live mullet or crab in the near vicinity of the deep channels that separate the individual islands, connecting the ocean from Florida Bay. 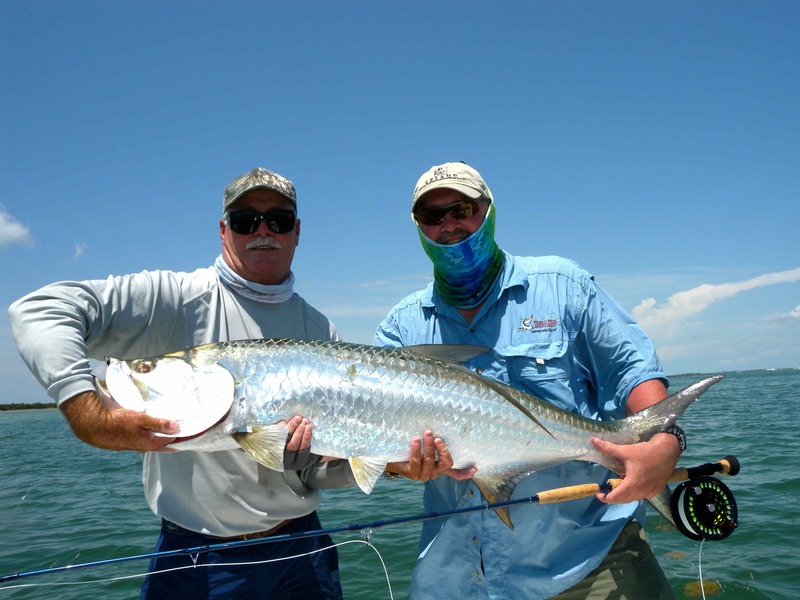 An increasing number of visiting anglers now fly fish tarpon, casting either a cruising fish as they swim across the shallow flats from a staked out boat, or quietly poling along looking for ‘laid up’ tarpon to cast a fly at. In recent years I find more and more I choose a fly rod for my fishing, especially in the tropics. 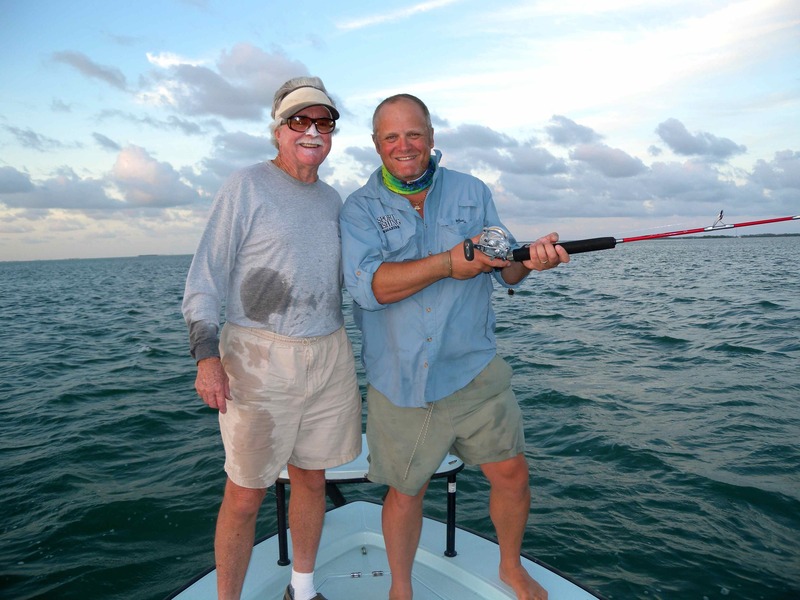 The number of species I have caught on fly has grown steadily, and has included numerous small tarpon up to about 20lb. During one trip to Islamorada I elected to designate several days exclusively to try and catch a large tarpon on fly, and this is my story. Fishing out from Bud n’ Mary’s Marina with my very good friend Capt. Bill Basset I caught a magnificent sixty pounder on the first day we fished. 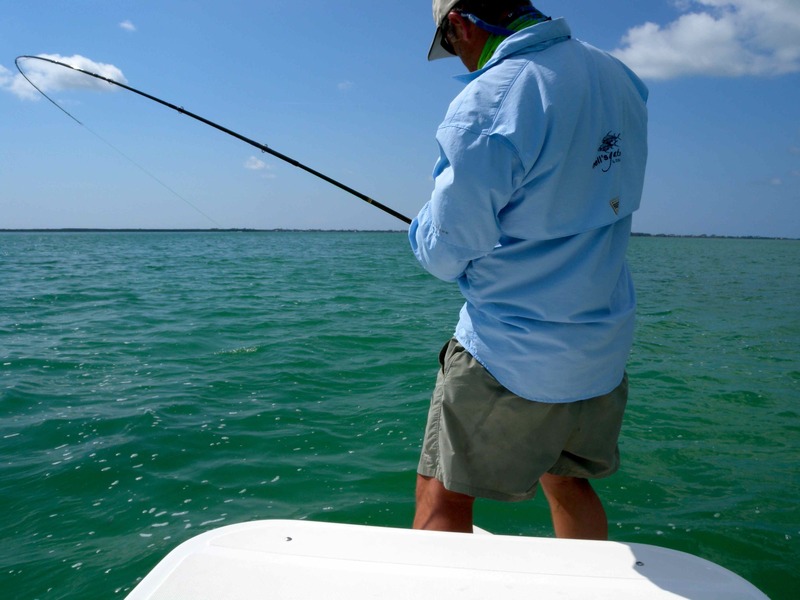 We were staked out along the edge of the ocean side flats at the northern end of Long Key, casting to cruising fish. It was here that the famous Long Key Fishing Camp was once based, a place where several past US presidents and famous writers of the time such as Zane Grey used to regularly come to fish for the silver king, in the years before the camp was destroyed by 180mph winds during the big hurricane of 1935. Standing at the bow of Bill’s boat we scanned the flat in front of us for cruising fish. 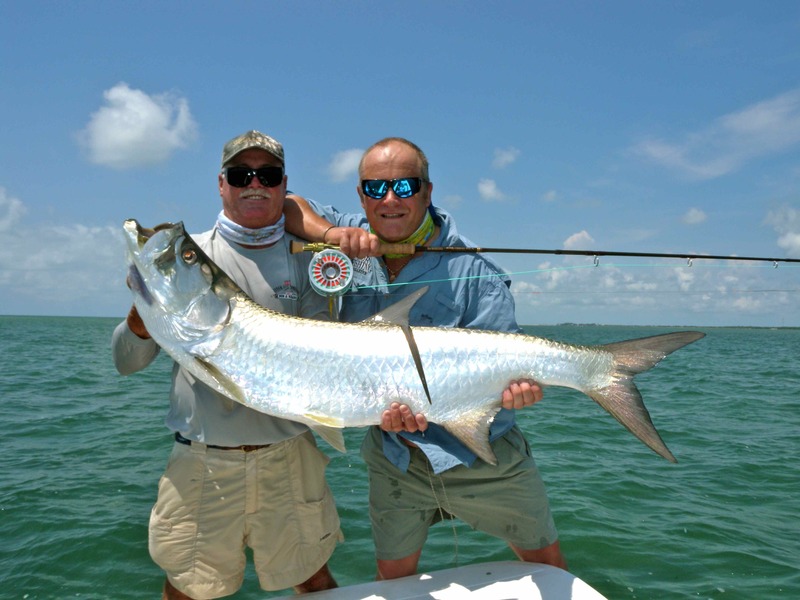 Throughout the hours we fished many tarpon swam with casting range, either individuals or pairs or groups of up to a dozen or more fish that included individuals weighing upwards of 150lb, fish that make you feel somewhat under gunned with a fly rod! I got to cast at many of these fish, and more often that not the tarpon barely acknowledged my fly, swimming right past it with a nonchalance for which the species is noted. One or two swam towards it only to refuse at the last moment, others still spooked and swam off the flat like a scolded cat. Eventually I put the fly in front of a group of four fish, one of them broke ranks and glided over towards it, opened its mouth and inhaled the fly. I struck, set the hook, the fish jumped, jumped again, ran, jumped some more, and after about 15 minutes we released that 60 pounder. A tremendous fish on a fly rod yes, but I wanted a bigger one. On my second days fishing Capt. Bill had taken me to the gulf side of Lignum Vitae Key, to an area known as Texas Lake, a big fish location. 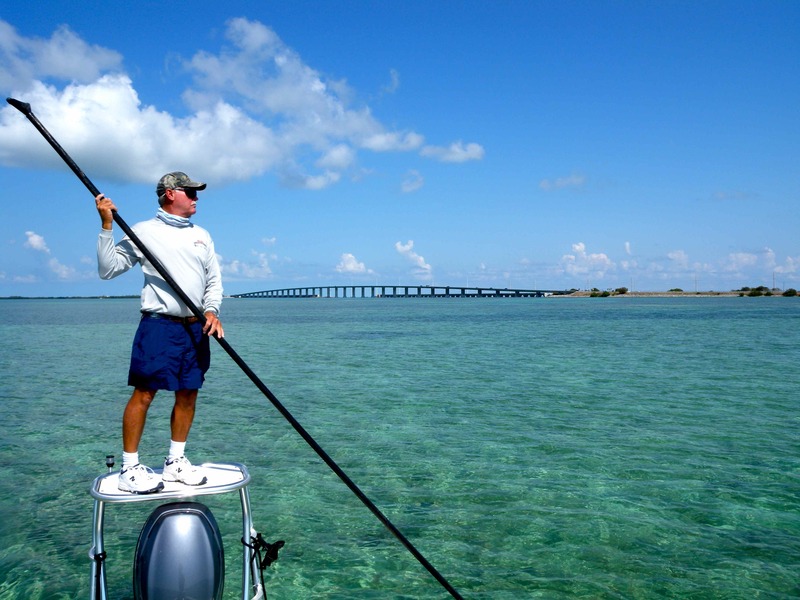 The plan was to quietly spend an hour or two gently poling the edges of the flats looking for laid up tarpon, while waiting for the optimum time of tide to return to the ocean side flats off Long Key to try and repeat and beat the previous days success. Almost immediately we started to see a few tarpon rolling. Most were huge fish that gently ‘head and tailed’ through the glassy surface film, the rich morning sunlight giving them an almost golden sheen. This really was the perfect morning to be fishing with a fly rod, not even the slightest breeze disturbed the oily calm surface of the water. Stood on the bow, fly rod in hand, patiently I waited for the first shot at a fish that I knew would come. I remember that at one point and for no apparent reason I started to smile and think to myself, life really is very good; tarpon fishing in the Florida Keys can have that effect on a man! Then a big fish rolled about 100 yards dead ahead of us, and ever so gently Bill poled us on a course to intercept the direction it was moving. As we got to within casting range I started to strip some extra line from the reel, made a quick few false casts and shot the line to a point I estimated to be about 12ft in front of the fish. I waited a few moments for the cockroach fly to sink, then started to strip it back with long, slow pulls. I will never forget the take from that fish as long I live. Just why a big tarpon will attack a 2in fly with the aggression that that fish did is totally beyond me, but attack it did, its huge head, gills widely flared, erupted all but vertically out of the water an engulfed the tiny creation of feather and fur. Had that fish roared I am sure I would have thrown the rod overboard and dived to the deck for cover! I can’t remember striking, but I suppose I must have, I think for a moment or two I was in state of shock. 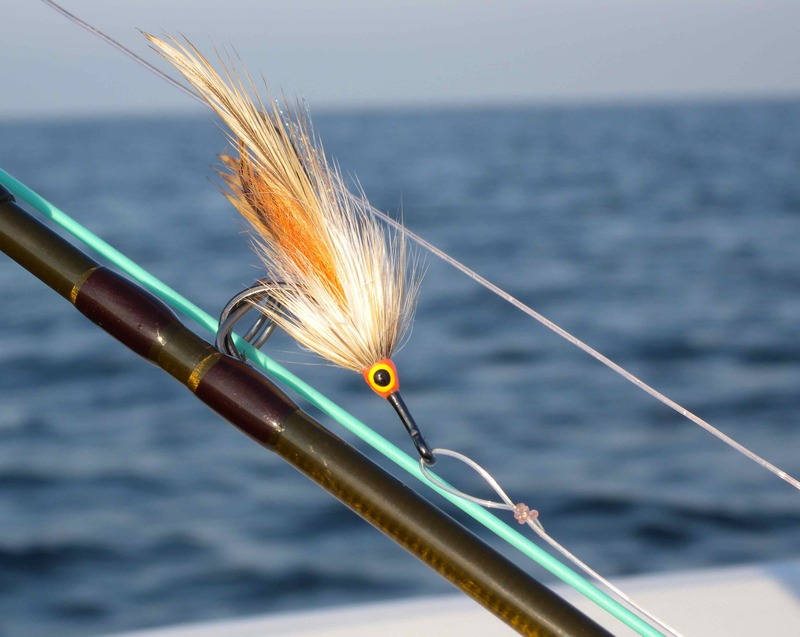 Thankfully the fish ripped all the spare line off the deck and out through the rod rings smoothly, and as it screamed off across the flats on its first 200 yard run the reel screamed, while I held the rod as high as I could, ever ready to bow as soon as it jumped. At the end of the run the tarpon started to jump, and did what a show that fish gave! Several times during those anxious, explosive early stages of the fight Bill asked if I was still hooked up, in all honesty I think both of us were fully expecting the fish to either break the line or throw the fly at any moment. As the madness of those first few minutes started to settle down, the thought first occurred to me that I might actually be in with a chance of landing this fish. At first we concentrated on keeping the end of the 90ft fly line on the reel, and the fish as close to the boat as possible. A few other boats were running through the area posing some risk of cutting the fish off, but a greater risk was posed by the amount of buoyed crab traps in the area we were fighting the fish. Had the fish swum the line around one of these that would have been the end of that. With the fish swimming off the bow I applied the absolute maximum of side strain I could, at all times trying to force it away from the direction in which it was trying to swim, in an attempt at tiring it. When a hooked tarpon starts to tire it comes to the surface to gulp air, and if it achieves this instantly you can feel the extra power from the revitalised fished. Consequently each time the fish rose I would applying as much low down side strain as I could and occasionally the tactic worked. By the time the half hour mark came and went I had the fish swimming perhaps 20ft from the boat, slowly cruising with the current, driven along effortlessly by its huge paddle of a tail. On two or three occasions Bill went forward and grabbed the leader, but each time he tried to pull the fish those final few feet to the boat it somehow found the necessary reserves of energy to surge away from him. However on that very special morning that fish had my name on it, and following a monumental one hour fight Bill reached down, grabbed the leader and pulled the fish alongside the boat; it was immense. Clearly she was well over a hundred pounds, just how big we’ll never know. Bill and I settled on a figure of 110lb. She was caught on an IGFA regulation 20lb class tippet: truly the fish of a lifetime. Tarpon, magalops atlanticus, are essentially an Atlantic species of fish typically found throughout the tropical regions of that ocean. Consequently tarpon are found throughout the Caribbean and as far north as the Carolina’s on the East Coast of USA, and south into northern Brazil. 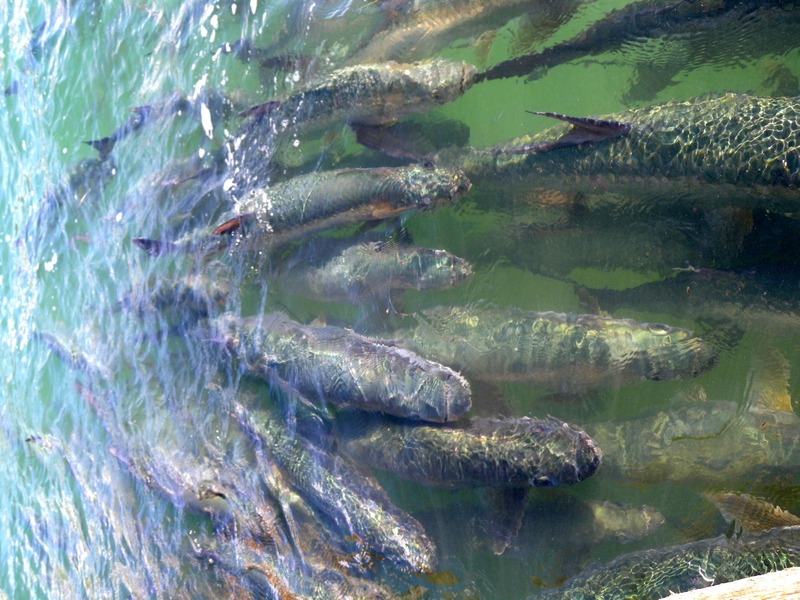 In recent years a small population of tarpon has established itself on the Pacific coast of Central America in Panama and southern Costa Rica, some fish apparently having transited via the Panama Canal. Tarpon are also found in the eastern Atlantic off the coast of West Africa between Angola to the South and Senegal in the north. In fact most of the biggest tarpon ever caught have been taken off the coast of Africa, with the current IGFA all-tackle record for the species, 286lb 9oz, having been caught in Guinea-Bissau. There are reports of several fish exceeding 300lb having been caught in several countries, notably Sierra Leone.